'LOVE' "...Our Love can take us anywhere..."
Choose 4 special locations to spell out the word Love in this beautiful romantic piece of art. 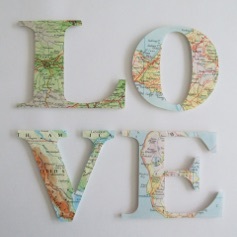 Made from vintage maps cut from 4 locations of your choice. A romantic, personal and unique gift for a loved one on Valentines day, as an anniversary gift or a wedding gift for a special couple or your future spouse. 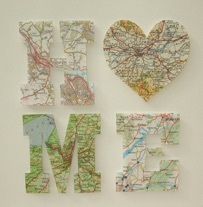 Choose 4 special locations to spell out the word Home in this beautiful piece of art. 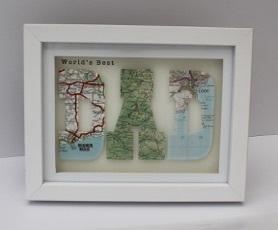 An original, personal and unique gift, perfect for a New Home present. What do you get the couple who have everything? 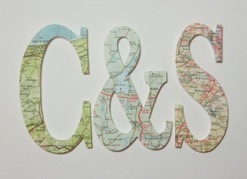 Would you like to give a romantic and bespoke piece of art to the new Mr and Mrs? 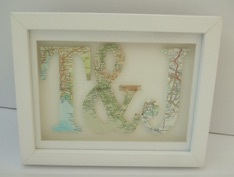 How about an original and personalised piece of art spelling out the couple’s initials? 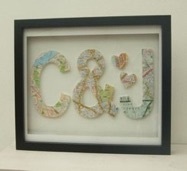 The initials are cut from vintage maps of where the bride and groom are from and the ‘&’ symbol is a map of where they live together now (or where they met, married or honeymooned etc) You can also add extra hearts should you want to include more than 3 locations. 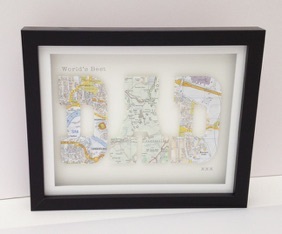 Mounted on a high quality cartridge paper and framed in a white, black or oak affect frame. 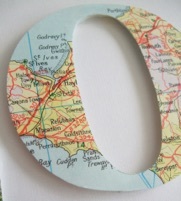 hand cut from vintage maps showing locations of your choice. Mounted on high quality cartridge paper and framed in a white, black or wood affect box frame. Please contact me for a quote for names with 4 or less letters. 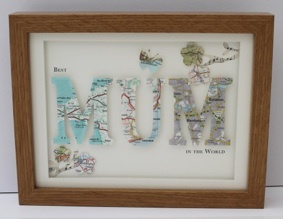 Choose 3 special locations to spell out the word Mum in this beautiful piece of art. 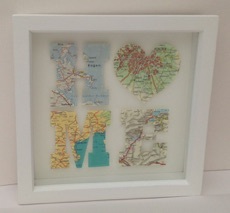 Made from vintage maps cut from 3 locations of your choice. Framed in a white, black or wood affect box frame. Additional locations can be added in the form of flowers and butterflies. 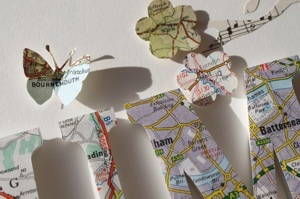 £2 each for each additional map used for flowers or butterflies. 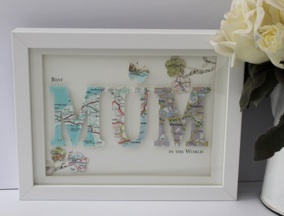 An original, personal and unique gift, perfect for a Mothers day, birthday or general gift for Mum. 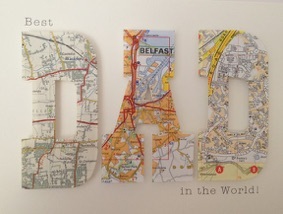 Would you like to get your Dad something a bit different this year? instead of the usual socks, tie or chocolate? Well look no further! 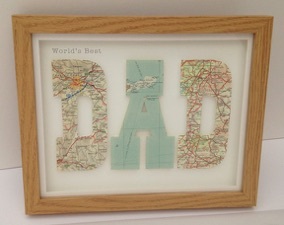 Let your dad know that you think he’s the best Dad in the World with one of these original and personal pieces of art.